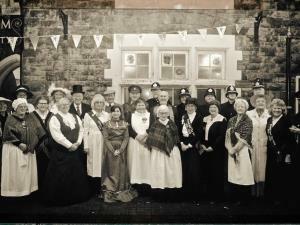 Porthcawl Museum MuseumThis museum is located in the Old Police Station at the very heart of the community, a building that would have been used for over a hundred years as the centre of law and order here.The Porthcawl Museum and Historical Society was founded in October 1972. Over the years, through donations and loans, the Museum has amassed in excess of 8,000 items. These include: a documented history of the town and surrounding areas, a wide range of artifacts covering household items, commerce, education, politics, social history and entertainment. Other items include military history and memorabilia from the last century, ceramics, rare local documents, thousands of local photographs, and archaeological items including the Blundell Collection. ?The second largest costume collection of an Independent museum in Wales, is contained in the upstairs storerooms whilst special items from the Samtampa and Stalheim disasters and the Porthcawl Railway are a significant part of the collection. Public Conveniences are 100 yards away from the museum entrance. There are many cafe's within walking distance. Junction 37 from the M4 or the A48 from Bridgend. The Museum is in John Street which is pedestrianised from 11:00 to 17:00. There are 2 car parks within 5 minutes of the Museum at Dock Street and Mary Street. Bus stop at the top of John Street, 5 minutes walk from the Museum.